The Tanoshiboy Chronicles: Design & Illustration Blog: A Business Card is Just Another Art Canvas! A Business Card is Just Another Art Canvas! We've all seen hundreds of business cards in our lifetime. I'm a firm believer in business cards still being an effective marketing tool, but when you have your logo, your name and contact info on it with no creativity whatsoever, you're just another business card. Remember, your first impression is the most important, but your business card is the tool that helps them remember that impression. Here's my business card for example. There are 12 different designs to choose from on the back. My goal was to make my business card, not only unique, but fun; like trading cards. That's my brand and how I want to be perceived. Don't just tell people how great you are at what you do, show them. I can't tell you how many people have remembered me based on my business card alone. And the ones that learned about me through a third party, always mention the card that referred them to me. My card is saying to each potential client, "This is who I am and what makes me different from the rest". You can do the same. This troubled economy gives us the opportunity to be clever and think outside the box. You might be thinking, "Dennis, I'm not an artist. This idea wouldn't work for me." That's because you're not thinking 4th dimensionally, as Doc Brown would say. Check out this idea from moo.com and see how you can take your favorite quotes (or some of your own knowledge) and place them on your cards. So there you have it. I hope this has made you rethink your business card. If you have any questions, I'd love to help. I hope that Heather and I can team up on her ideas to bring her brand and new cards to life. If it works out I'll share the progress and final results. Thanks for reading and remember... it's not what you see, but what you make others see! That is a great idea. This was a really great post. Your cards speak for themselves. Great post and idea. I will definitely keep you in mind for my next batch of cards. @Julie The good thing is, it's not too late. I met a woman one night at a mixer who had a great business idea that I thought would be a hit. She even got herself a booth. Well, the night didn't go so well for her. I felt bad for her, but when I saw her materials, I could tell why. All her materials were printed on her home printer on very cheap paper and her business cards were printed on those tear-away cards you can pick up at Staples. Her logo was "designed" by her sister-in-law who knows photoshop. I went over to educate her a bit (sensitive to her situation) and she said she didn't want to spend a lot of money. I told her that was her problem, it's not an expense, it's an investment. I can see why $2.99 would look attractive to most people. It's a great deal. But if we forget the quality and focus on just the quantity, then it relfects poorly on us. You are so right! I spent a great deal of time tweaking my logo and love it. I've had lots of complimets on it and I believe it is something that creates my "brand identity". Agree Dennis that's a good way of making an impression. How creative you get depends on what you do. In your case I would say the sky's the limit. A business card is an investment. We had a Virtual Tour business and needed to communicate 360-degree movement. That biz card is 6.5" x 2” and folds into a standard size (with a slight overlap). Our logo indicates movement and the person holding the card needs to open it. Once open, you need to turn the card 180-degrees to see a list of the types of businesses that benefit from our services. A subtle arrow directs you to the back of the card where our contact info was printed. That card was the keystone of our marketing materials. It was professionally designed and not inexpensive to print. Next to our website, that was our most effective piece of marketing materials. Thanks so much Dennis! I love your business cards. They're really cute, and I agree with you about the trading card aspect that Moo.com allows you. I have had people take like 10 of my cards at a time. I don't know if it's because they want all of them or if they think they're different cards. I have designer friends who don't even have a business card, and I really can't figure out why. Even Moo's beautiful cards are not expensive. I love them!! I have a very bright and colorful card myself and I love giving them out because they're so FUN looking. Your cards certainly highlight your business in a creative way Dennis. 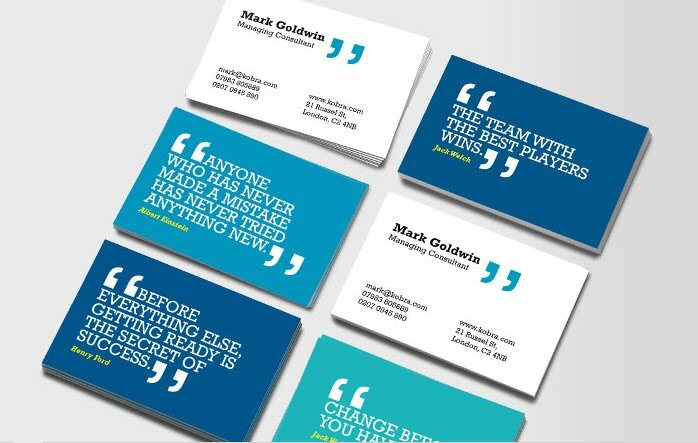 I must admit I am in favour of getting a designer to develop the look for all materials including the business card instead of the cheap options. A designer has the experience and skill that can make all the difference and that includes the business card. 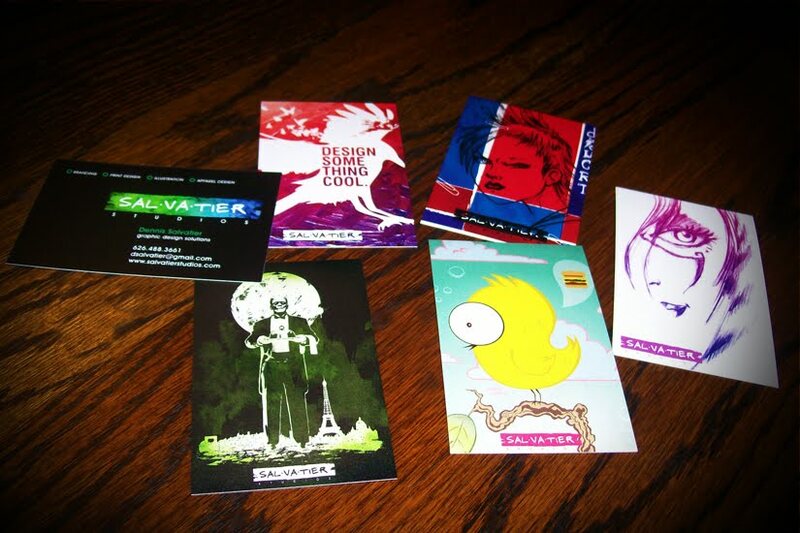 I love these Moo cards! I especially like the smaller sized ones as an alternative to use when you want to increase awareness about your website without handing someone a large postcard. @Sherryl That card sounds very sophisticated and has just the level of uniqueness to stand out. Thank you to everyone for the kind comments and conversation here. It really makes a difference to throw ideas around. @Violet I know what you're talking about. I've been thinking of getting some of those for the blog. I've designed business cards three times. Each time was an excruciating excercise because as you note, they are an investment and representation. If they don't look good, neither do you. Luckily I have an excellent print setup and access to high quality graphics, so all that was really left was to make sure I used good paper stock. Of course, actually desiging the look took forever, but it was indeed worth it. The material utilized for such printing can be dissolvable vinyl, flex, power outages, canvas or texture. That is truly unaccepted work that I've gained out of this http://ilustra.co.uk/animatics/ , from here I receive the 100% quality and unique illustrative work of graphical design, so in retrospect, I am referring this place for everybody who would like the best coming up with work and illustration skill for his or her work.